SO, who gets to follow in the footsteps of Lucy Anderson and Nicky Gavron in taking on the seemingly unbeatable love-him-hate-him-he-never-loses-an-election Brian Coleman for Labour at the 2012 London Elections? Tom Copley, an activist who went close to becoming a councillor in Camden earlier this year, admits he hasn’t ruled the idea out. A bright spark, he is credited internally with improving local campaigning in Camden and giving Labour the extra oomph to go on and win polls like the recent by-election in Kentish Town. The other name that has been cropping up since conference is Andrew Dismore, former Labour MP for Hendon. Whoever takes the task on, it’s a tough quest. Coleman won by around 20,000 votes last time out, his blue Barnet powerbase easily outflanking Labour supporters in Camden campaigning for Gavron. The top-up list would be a safer route to City Hall. 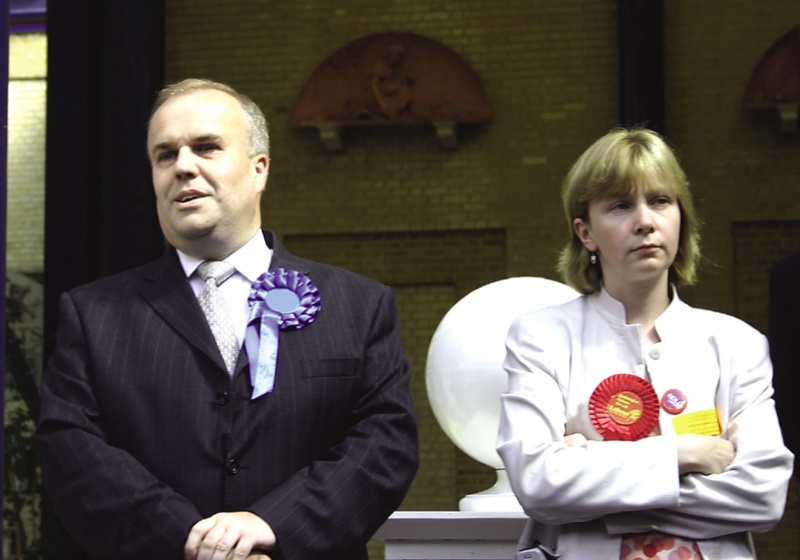 Still, it all gives us another chance to look at this snap from the count at Alexandra Palace back in 2004: Brian beaming and Lucy Anderson possibly looking the most pished off you will ever see an election candidate, her arms so tightly folded she could be cracking hazelnuts under them. Proud of her disgust at the result, I think she went on to use the image in Christmas cards, a badge of honour to her from a heavy defeat. 3 Comments on Brian Coleman vs ? Not sure I’ve seen that one… was that in the CNJ? Although I’ve heard nothing but praise for Tom Copley, this seat needs a candidate who can take votes from Coleman in Barnet. Andrew Dismore has the experience and record to do so, notably in Hendon constituency. As Coleman is also one of the most objectionable gravy-trainers around, a candidate who’s up for the scrap is a good idea. AD certainly has plenty of fight in him, and has been sparring with Coleman for years. I’ll declare my interest now – I used to work for Andrew Dismore, and consider him a friend, but I hold my views out of a simple desire to see Labour win this seat, and get rid of Coleman.